Sometimes, we do our best work when we are the least concerned with the outcome. 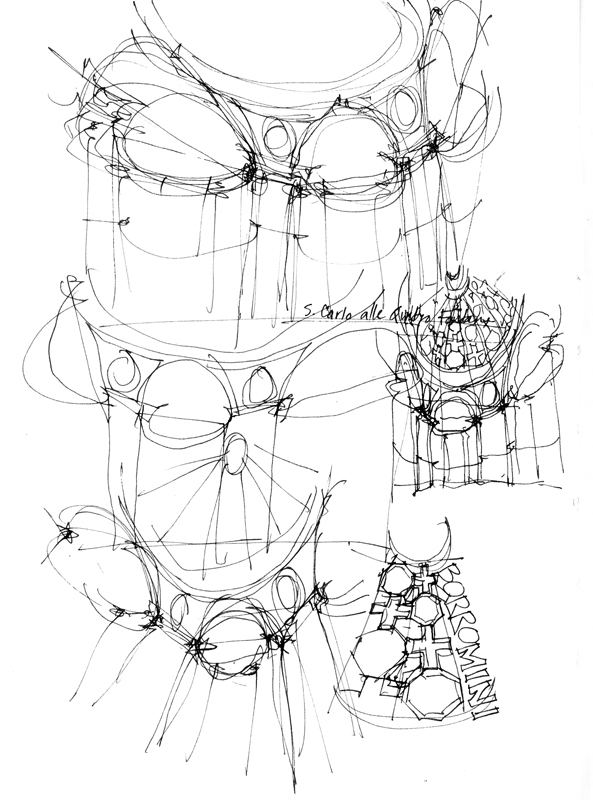 By showing you these images, I do not mean to imply they are examples of my best work but there is a fresh quality to my drawings either when I don’t have the time to overthink a drawing or when I am demonstrating an idea or approach as I am teaching. 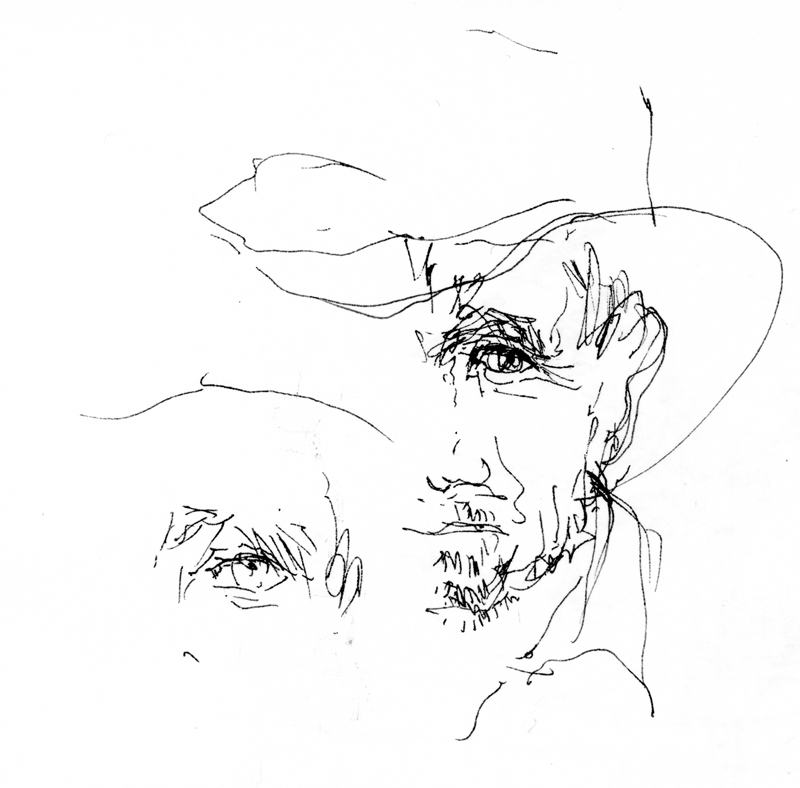 Whenever I view one of my own drawings or see someone else’s work, my immediate, instinctive reaction is to ask: How could the drawing have been improved? Sometimes, the answer is better composition; at other times, it’s more context. But the more common response for me is increased contrast. I’ve written about this before but it bears repeating that contrast is a critical part of both seeing and drawing. Without seeing contrast, we are not able to differentiate one thing from another. 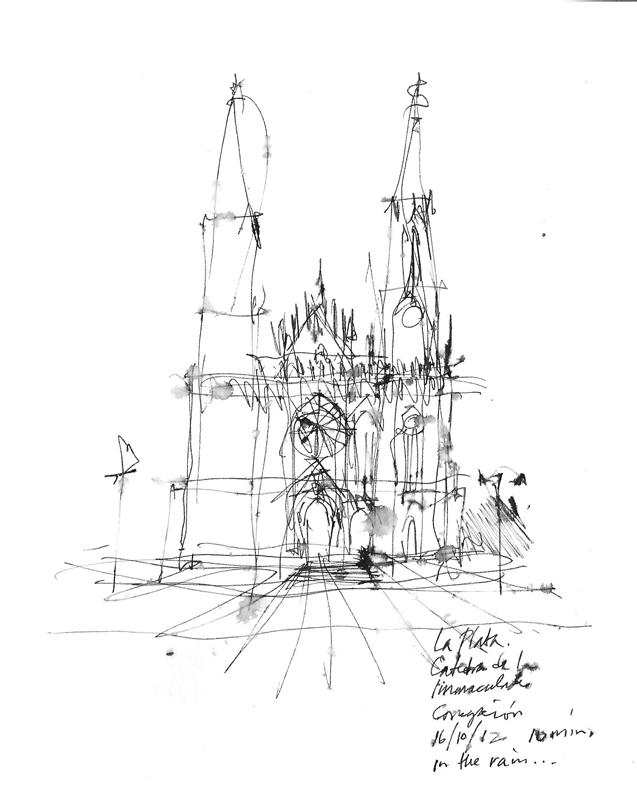 And without drawing contrast, we diminish the hierarchy that creates interest and focus in a sketch. 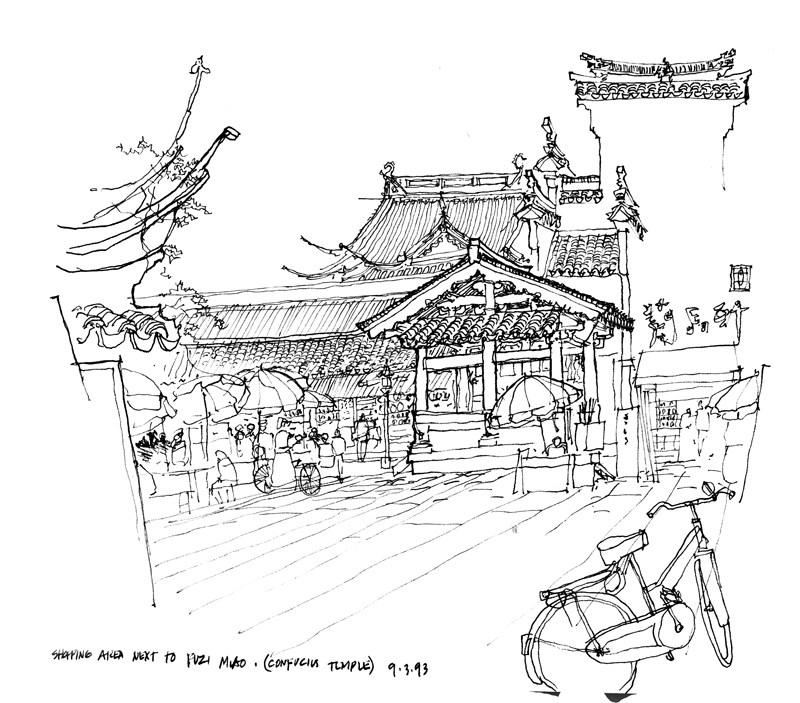 There are several kinds of contrast that we can use in a drawing. 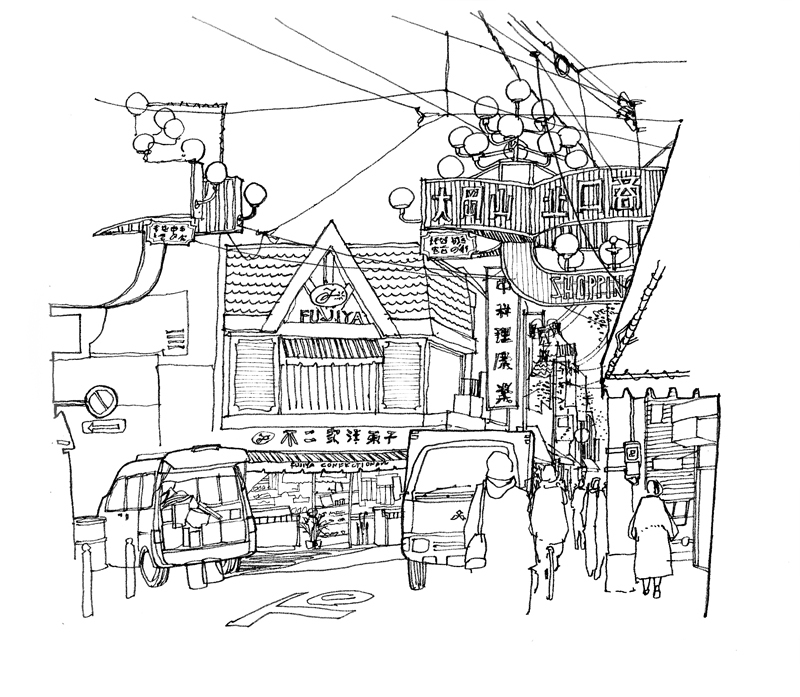 Perhaps the most obvious is distinguishing between heavy and light line work to enhance spatial depth—what is near versus what is further away. Another is contrasting areas of greater detail with spaces of lesser detail, or areas of precision with those of ambiguity. 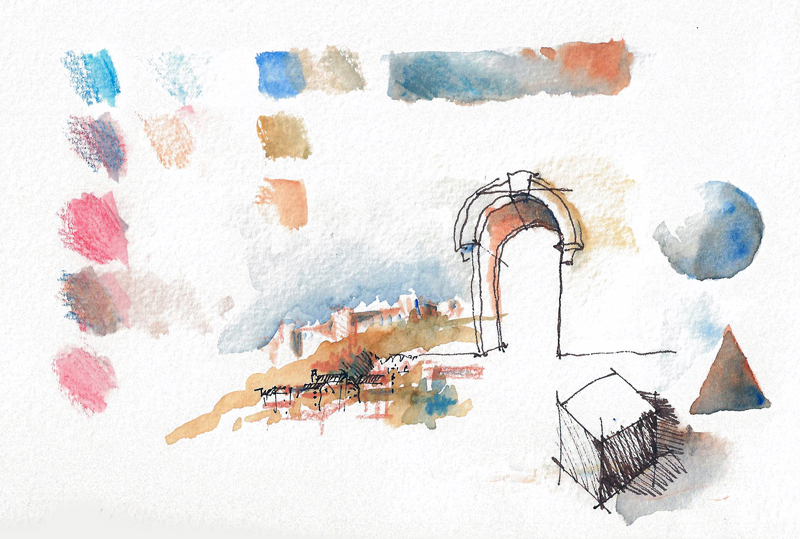 And in the case of watercolor sketches, it is definitely necessary to differentiate not hues but rather zones of tonal values. 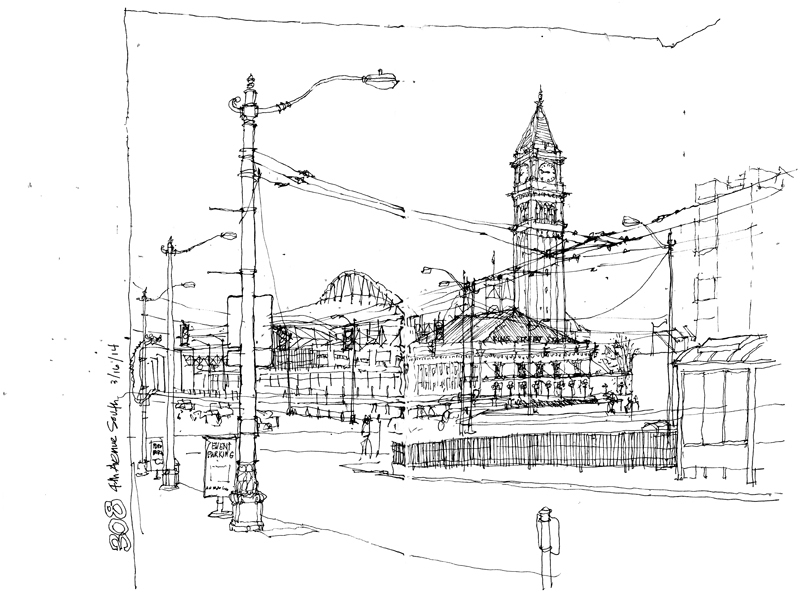 For the monthly meeting of the Seattle Urban Sketchers group yesterday, we met in the International District of Seattle. I caught the bus downtown and as soon as I got off, I confronted this view of King Street Station with Century Link Field in the background and a maze of overhead wires in the foreground. I just had to draw it while standing under the awning in front of 308 4th Avenue South. 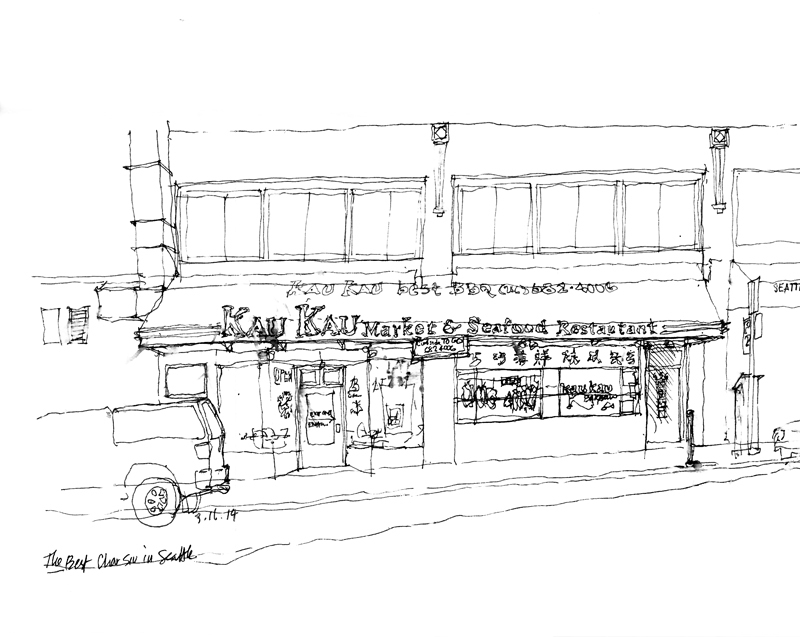 Thinking about what to sketch in the ID district, I was convinced I had to document Kau Kau, which, as the sign on its awning says, is home of the best BBQ (char siu) in Seattle. So tender and juicy. You can see the effect of raindrops on the page. Finally, to get out the rain and damp cold, I joined a few others in the tea shop housed in the Panama Hotel. Designed by Japanese American architect Sabro Ozasa, who was a graduate of the University of Washington, the hotel opened in the summer of 1910 and was designated a National Historic Landmark in 2006. In the basement is the best surviving example of an urban-style Japanese bathhouse in the U.S. 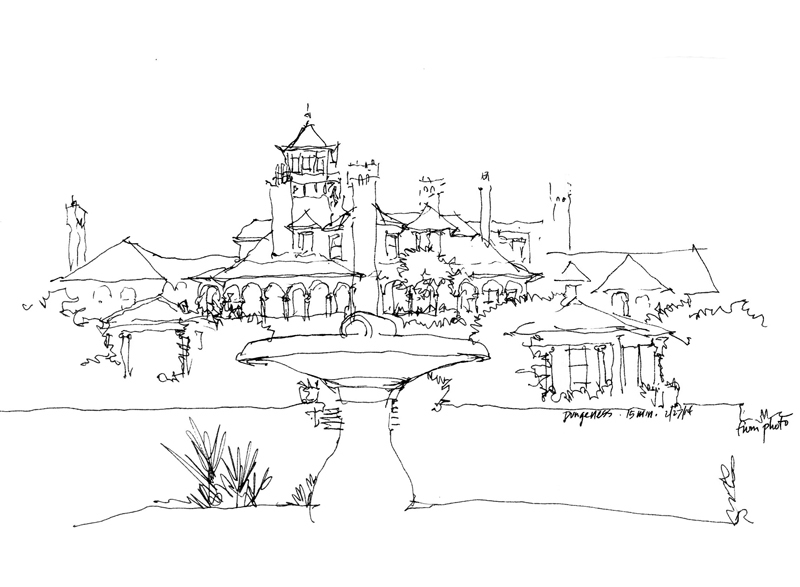 Here are two sketches done during our recent trip south to St. Augustine, Florida. The first is of Flagler College, formerly the Hotel Ponce de Leon, which was designed by John Carrere and Thomas Hastings and built by Henry Flagler in the late 1880s. The original hotel was the first in Florida to be supplied with electricity and contains beautiful Tiffany windows. 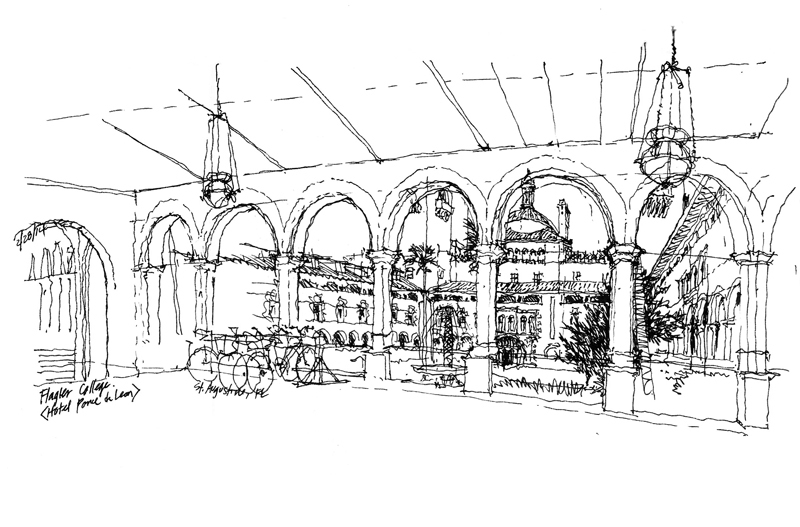 The view was drawn from the front arcaded walkway that helps define the entrance courtyard. 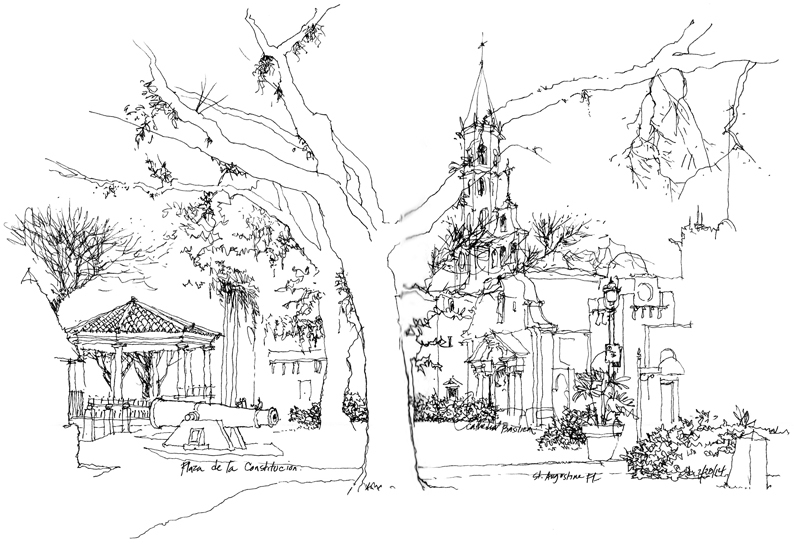 This is the Plaza de Constitucion in St. Augustine, Florida, which was established by Spanish Royal Ordinances in 1573. 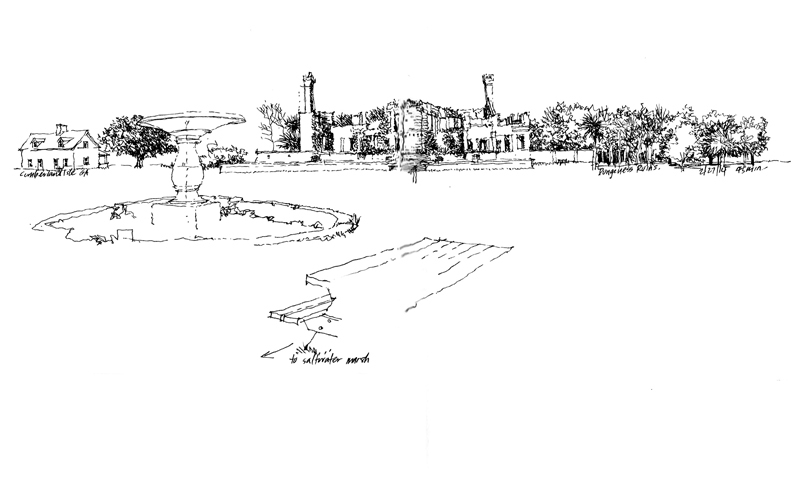 After I began with the contours of the tree in the foreground, the drawing seemed to take on a life of its own, moving left toward the gazebo, and then to the right and ending with the 18th-century Cathedral Basilica in the background. It ended up as a two-dimensional graphic that relies more on overlap than linear perspective for depth. After the workshops at the Savannah College of Art and Design, we drove south to Cumberland Island, Georgia’s largest barrier island, accessible only by ferry and now a designated National Seashore overseen by the National Park Service. At the southern tip of the island are the Dungeness Ruins, the remains of a mansion built by Thomas Carnegie, brother of Andrew Carnegie, and his wife Lucy in the 1880s as a winter retreat. This panoramic view of the site shows the open grounds, which looks southward over a vast saltwater marsh. While waiting for the ferry that would take us back to the mainland, I popped into the Ice House Museum and was excited to see a photograph of the mansion as it was before it burned in 1959. 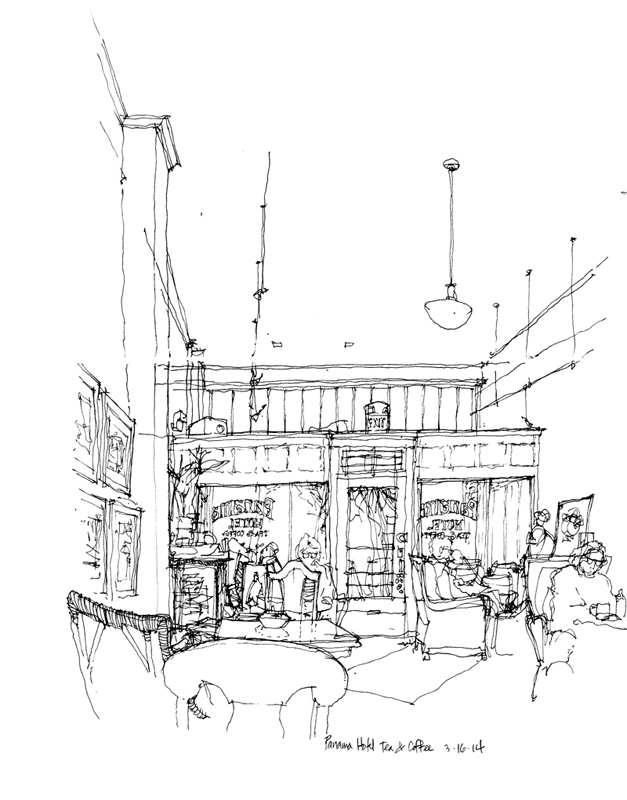 I quickly drew this view to show a little of its character in its heyday.